March 21, 2014 / JoAnn / Comments Off on Mack Needs You!! Mack has been adopted by his foster mom’s roommate. They just couldn’t let him go. 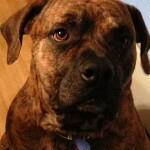 They stated, “no one has ever loved me the way Mack does!” We are wishing Mack and his new family a very loving future. Mack is now at almost 100 pounds and is a very special boy. 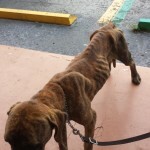 Remember, when Mack was found he was only 56 pounds which is nothing for a Mastiff. With the love and kindness of his foster family he is becoming a strong healthy dog.